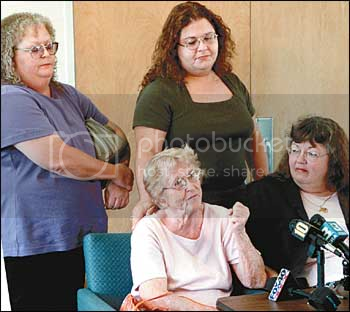 Robert Wendland’s sisters, Debra Hofer, left, and Rebekah Vinson listen to their mother, Florence Wendland, seated, left, and Lodi attorney Janie Hickok Siess talk about Thursday’s California Supreme Court ruling. The 49-year-old Stockton man was left unable to speak, feed or care for himself, but wasn’t in a persistent vegetative state, doctors said. Wendland’s mother fought removing life support all the way to the state Supreme Court, saying he could respond to her voice, squeeze her hand and participate in some adaptedactivities. The decision also reversesthe state appellate court ruling that McNatt erred in requiring a higher standard than the conservator simply considering the conservatee’s best interest in good faith.